The issue of whether or not barging salmon around dams is effective is taken to court. Idaho's Lower Snake River dams block salmon recovery. 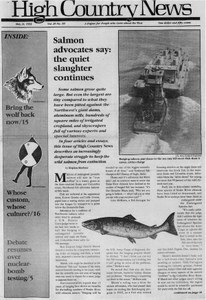 A summary of pending lawsuits between the government, salmon advocates and hydropower interests. The author contests the The Bonneville Power Administration's claim that salmon protection is to blame for its rising rates. The writer challenges the Bonneville Power Administration's "more' and "bigger" goals. The wolf recovery program in Yellowstone needs public support. A water conference is hosted by the University of Colorado School of Law. The University of Nevada will make a Great Basin ecosystem map. A conference hosted by Oregon State University focuses on cutting trees to enhance ecosystems. ORVs may be banned from Oregon Dunes National Recreation Area. Jackson Hole will become the home of the Yellowstone Grizzly Foundation's center for bear research. The Belknap Reservation and the WILD Foundation host a conference on indigenous living. The National Parks and Conservation Association warns that water pollution and depletion plague the country's national parks. Does Elvis live in Jackson Hole? A poster's profits will fight plans to return wolves to Yellowstone. The AB Lateral hydropower project on Colorado's Gunnison and Uncompahgre rivers is vetoed. Wild and scenic designation on the Klamath River may stop an Oregon hydroelectric project. The Kootenai River sturgeon is up for threatened or endangered listing. Texas congressman Mike Andrews proposes a national park linking the Guadalupe Mountains and Carlsbad Caverns national parks. The New Mexico Game and Fish Department rules that science must be "humane and appropriate' after a songbird strangling near Carlsbad. A judgment on tree-cutting in Toiyabe National Forest lands rancher Wayne Hage in jail. Navajo tribal chairman Peter MacDonald is sentenced to 14 years for his role in a riot that left two dead. Fossil poachers mar the landscape in a search for a prehistoric fish. Spring snowmelt helps the endangered cui-cui sucker fish in Nevada. A National Bighorn Sheep Interpretive Center will open in Dubois, Wyoming. Nuclear bomb testing could resume in Nevada. An Idaho school distributes pro-timber propaganda in the form of the cartoon "Timbear'.